I love the clean slate: The brand new begging that the start of the academic calendar promises. The smell of notebook paper, new shoes and freshly sharpened pencils are all smells that my inner-nerd always looks forward to. While many use the New Year as a chance to make a new start, every September seems to be a second “New Year’s Day” for me, a time when I wipe the slate clean of my financial, nutritional and other life mistakes and missteps and start anew- determined to get that “A” grade this time! So, as you celebrate the students in your life and their new found journey to excellence this academic year, I invite you to go “back to school” with a review of some frugalista basics that are sure to help you make the grade when it comes to acing your family finances. Remember that budget you set at the begging of the year? Let’s take a look at it and see what tweaks you need to make, particularly with the holiday season looming. Wait, you don’t have one? Well, now is as good of a time as any to develop one! Either way, gather your receipts from the past three months and then tally what you spend on food, transportation, dining out, entertainment and other expenses. Average this amount into a month average. Now, reduce that average by 10 percent-this is a great starting point to start saving. As your cupping and saving skills improve, you will soon see that you can trim that to 12, 20- even as much as 25 percent each month. How do you cut that budget that is already to the bone? You will need a spending plan, based on the goals established in your new budget! Take that new number and divide by four for a weekly spending budget and when possible, take the amount in cash with you on any shopping trips. Why cash? Plastic is much easier to cheat on your budget with- and with a designated amount of cash in your wallet, you are bound to pay attention to that shopping plan and avoid those tempting impulse buys! Your spending plan can be developed online using a Google Docs spreadsheet 0 my favorite_ or with good old pencil and paper! Grab the sales flyers from your favorite stores and have your Smartphone handy to double-check any of your installed savings apps, such as Ibotta or Ebates, to see what additional savings you can make with your purchases. Using these tools, plan you shopping trip- and don’t forget to use coupon match-up blogs to garner additional coupons for the items you added to your shopping list! Write your list by store and mark which items on your list have a coupon. You should also track the sales price for the product. 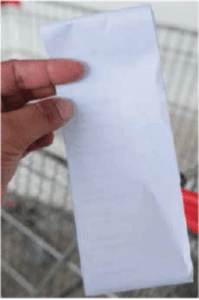 Clip your coupons for each store with a paper clip and gather them all together with your shopping list. There you go- you know what you need, how much it will cost and have everything you need for an efficient and only-saving trip to the store. This sounds time-consuming (it isn’t once you do it for a week or two) and I promise you, you will not only stick to your budget but save tons of time on your shopping trips. I actually do mine with a glass of wine and an old episode of “Friends” on the television- I find it relaxing in a nice way to “pay” myself back with the added savings to my family!